I am a contributor to a new title from One Day Projects, a collaborative publishing project from Eliot Dudik and Jared Ragland. “On August 21, 2017, the total solar eclipse provided a rare opportunity for people across the United States to experience a collective encounter. Inspired by both the natural wonder and symbolic possibilities of this unique occurrence, photographers from inside and outside the path of totality were invited to document and share their experiences. 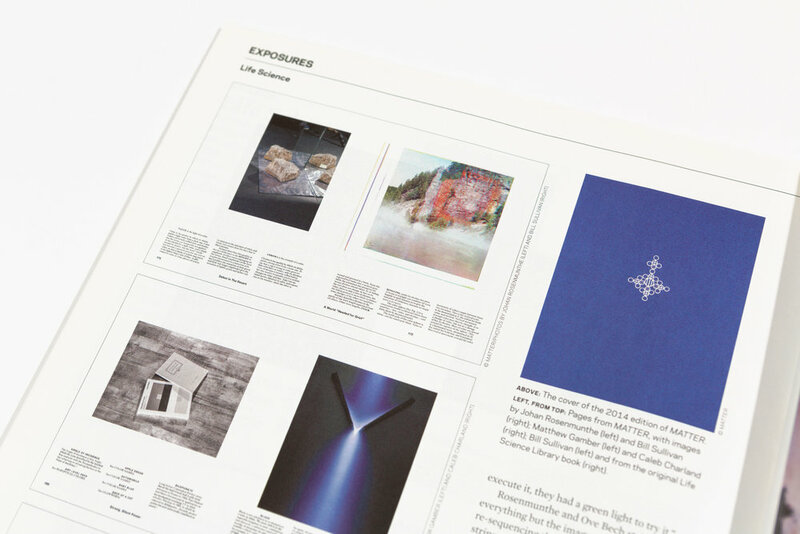 The resulting book, And light followed the flight of sound, features 85 images by 52 emergent and established photographic artists. 8 x 6 x 1 in. x 27 ft.
"The Aaron Siskind Foundation is pleased to announce the 2017 recipients of the Individual Photographer’s Fellowship offered to U.S. artists working in still photography and photography-based media. The Aaron Siskind Foundation works to promote and protect Aaron Siskind’s artistic legacy, to foster understanding of and appreciation for his work, and to support contemporary photographic art and artists. Aaron Siskind established this grant prior to his death in 1991 to assist independent creative photographers to pursue personal projects without bias to any particular form of the medium. Full press release available from the Aaron Siskind Foundation. 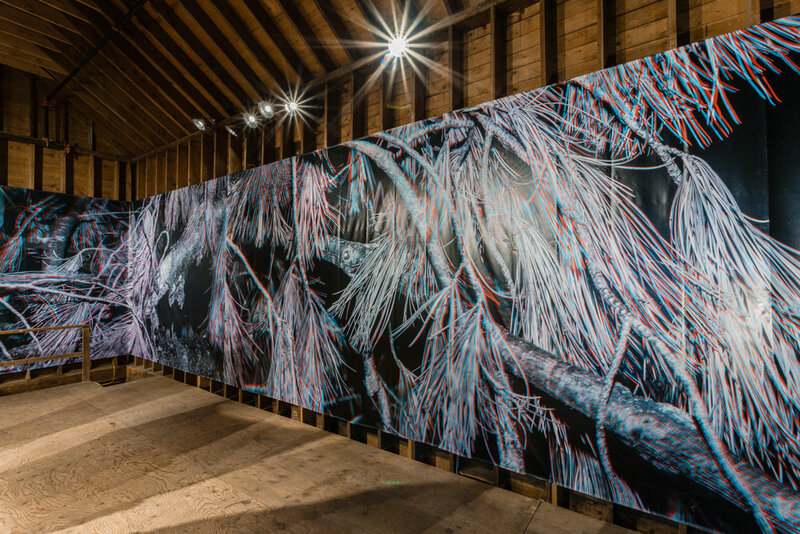 "This exhibition, Vagabond Time Killers, features the work of 53 emerging artists; the majority of which have come to us as artists-in-residence and have lived and worked here, in Wassaic. The works included depict each artist’s relationship, perception, and interpretation of our current location in space and time, and how art and its context can transform people, places, and ideas. Each of these artists and their work are part of Wassaic’s quirky history, and embody the spirit of the Vagabond Time Killers." I will be in residence at Vermont Studio Center from the month of April, making process-based darkroom experiments, working on files for a large-scale installation, and drafting an image sequence for an artist book. Aperture has invited the artist-run super PAC, For Freedoms, to curate and implement an improvisational exhibition and series of dialogues that investigates the photographic collective as a model for responsive artistic production. This two-week project will feature live events that bring together several active photography communities to discuss the practices, benefits, and methodologies of collectivity, while focusing on the question of what defines “the political” in art-making today. Each collective is invited to contribute a visual prompt for discussion and selected works to be presented in the space; the main propulsion for this activity, however, will be a series of in-person activities including meet-ups, salon-style conversations, and other events. The collectives included in the exhibition are EverydayClimateChange, Invisible Borders, Kamoinge,Piece of Cake, Rawi(ya), and WRRQ. 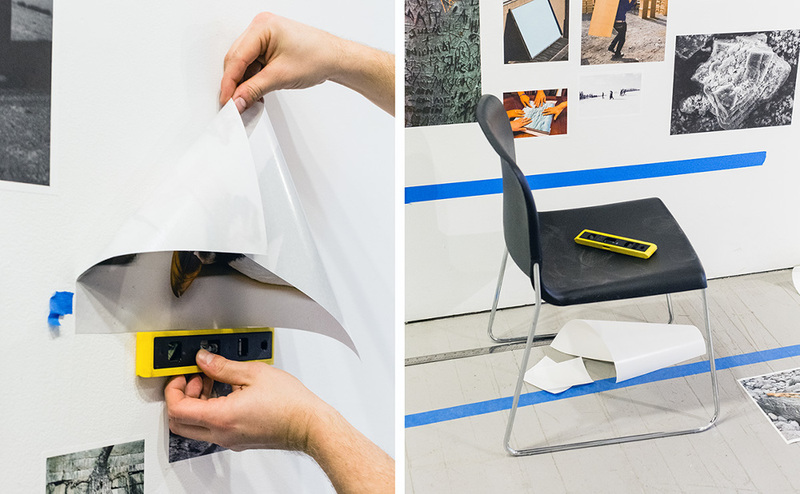 This winter Transformer Station presents Unfixed: The Fugitive Image, an exhibition featuring 11 national and international artists who are exploring the ephemeral image in a wide variety of ways with and without cameras, in still images as well as video. Although photographic images existed long before, the birth of photography is marked by the date when we learned to “fix” a representative image on a light sensitive surface permanently. Since then, the truth of photographic representation has been often questioned and much discussed. Less debated, but just as questionable is the permanence of the photographic image. Of course, eventually, all surfaces decay and images fade, but the artists in this exhibition embrace the fleeting nature of the image that is created by light and is eventually destroyed by it. I will be in residence at The Wassaic Project in Wassaic, New York to continue my book project on the co-inventors of Kodachrome, Leopold Mannes and Leopold Godowsky. "Model-based photographs can have a distinctly digital appearance. But models themselves can be made of anything, including massive data structures, so these similarities are anything but superficial. Matthew Gamber has made several photographic images that demonstrate how traditional physical models are continuous with computational models. In Stanford Bunny (x2) (2012) and Utah Teapot (2013), the titular objects seem to emerge seamlessly from a uniform color field of blue or gray. The effect is eerie, and reminiscent of the ganzfeld hallucinations produced in psychophysical experiments; they appear to be conjured up by the brain’s own restless inability to cope with structureless input." Read the rest of the article at Burnaway. 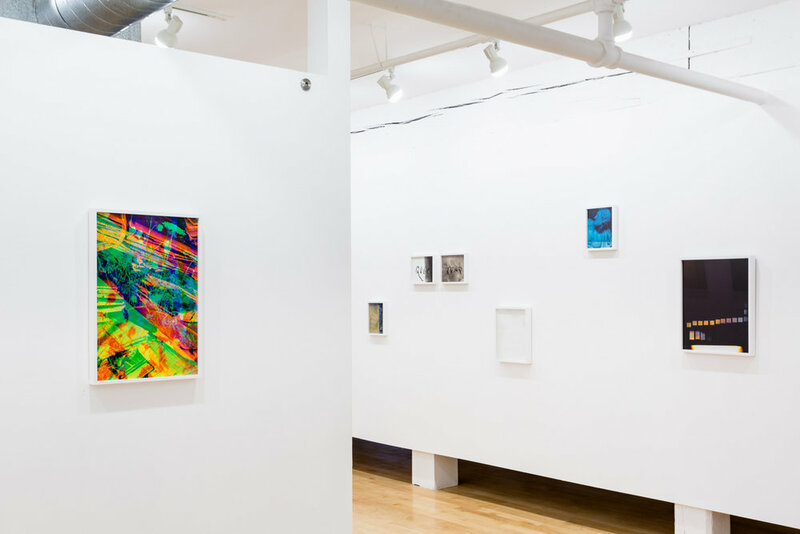 “Using a variety of photographic processes, the exhibition is an exploration of the meanings constructed around photography and the rules that govern its use. This exhibition is a survey of Gamber’s recent work based around his latest project, “Basic Ingredients of the Complex World,” his examination of how photography is both documentary and illusory – a paradox he demonstrates through experimentation with three-dimensional techniques. Stanford Bunny (x2) and work form Any Color You Like profiled in the most recent issue of photograph for the column, In The Studio. Read the column in the March / April issue of photograph. "After the One Thousand Books Art Book Festival, a curated selection of books from the bookmarket will be packed in a specially designed wooden crate that will function as a traveling book exhibition and sales platform. The exhibition will travel all over the world and visit museums, art centers and bookshops." The box: American pitch pine, German oak dyed with ferrous acetate, Wool / polyester felt, Polycarbonate. Crafted by Valdemar Jørgensen. 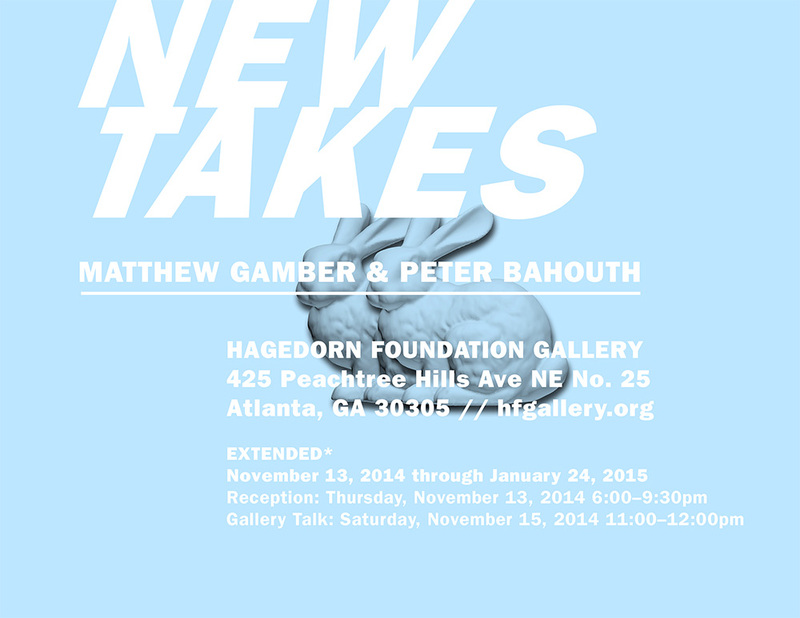 "Hagedorn Foundation Gallery is pleased to present a two-person lens based exhibition “New Takes”. 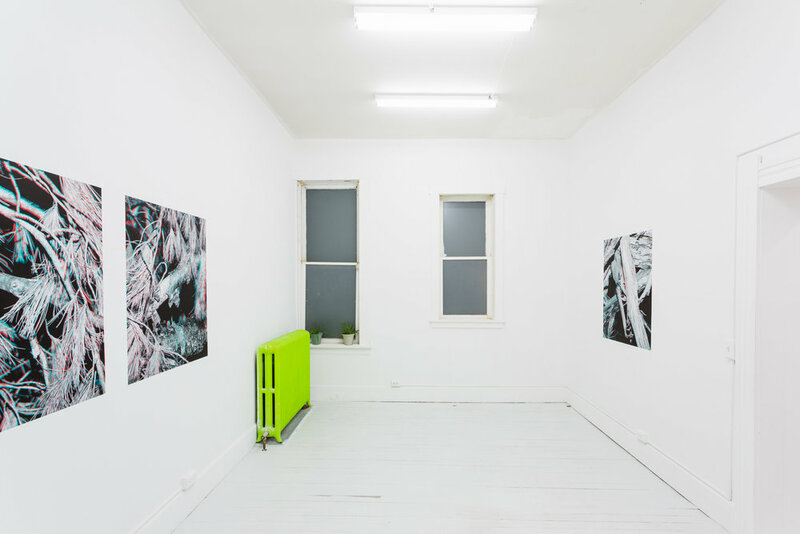 Artists Matthew Gamber and Peter Bahouth investigate various approaches to the photographic image, which resonate with a discourse about the philosophy of the medium, and tag ideas about the psychology of perception. Gamber’s work is abstract and technical, using photograms, abstracted photographs, and the projected image to open up a dialogue about surface information and culture."